Specifically designed to treat the signs of aging around the eyes that act in the critical stages of collagen life. Visibly reduces wrinkles and expression lines. Last generation cream specially designed for the treatment of the signs of periocular aging. It stimulates fibroblasts to synthesize connective tissue components (collagens I, III, IV) and polysaccharides (glycosaminoglycans and hyaluronic acid). Its tensile actives smooth the eye contour and visibly reduce wrinkles by stimulating the regeneration of collagen. Contains unique interference pigments that fade dark circles and fatigue marks. 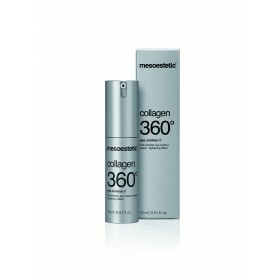 A bottle of Collagen 360˚ Eye Contour for home maintenance leads to results obtained in the beauty salon. Last generation cream particularly designed for the treatment of signs of periocular aging. It stimulates fibroblasts to synthesise connective tissue components (collagen I, III, IV) and polysaccharides (glycosaminoglycans and hyaluronic acid). Its tightening active substances smooth out the eye contour and noticeably reduce wrinkles, stimulating collagen regeneration. Contains exclusive interferential pigments that reduce the rings under the eyes and signs of fatigue. A collagen filling without injections? The traditional treatment with collagen involves the application of collagen injections in a specific area. Some patients suffer slight discomfort, especially when the injection is applied in the skin around the eyes. Collagen 360˚ Eye Contour presents a ‘filling effect without injection’, avoiding side effects (hematoma, sensitivity around the treated area, etc.). Its formula is rich in hydrolyzed marine collagen has been designed with the aim of re-densifying the eye contour without using needles. The skin around the eyes appears to be firmer, as if it was ‘woven’ from the inside. Apply morning and night in the eye contour by means of gently touching with the fingertips until it is fully absorbed. A rich, moisture intense cream, which provides powerful wrinkle reduction and firming effect to the skin. Enriched marine collagen gives a tightening effect to the skin and penetrates to stimulate collagen, elastin and protein production.